Natural Rubber is the Vulcanized product of the juice of the Hevea tree (Latex). Seals in brake systems. Seals in food & beverage applications. Most popular material for non-O-ring applications. Working Temperature Range: - 60 °F to + 220 °F. (Dry Heat Only). Natural Rubber features low compression, high tensile strength, high resilience, high abrasion and high tear resistance properties, with a good friction surface and excellent adhesion to metals. Until the inventions of synthetic elastomers in the 1930's, natural rubber was the only polymer available for O-ring manufacture. 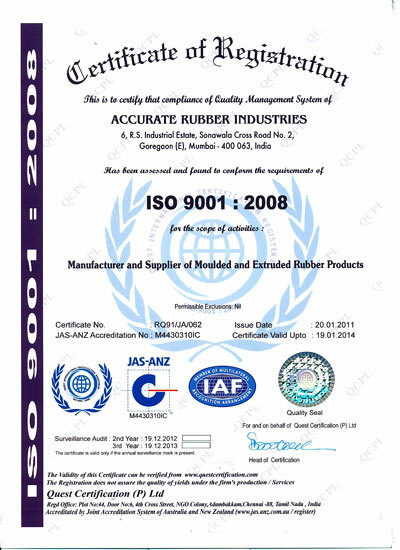 Still used today in FDA application for food and beverages seals, natural rubber features good resistance to organic acids, alcohol's, and automotive brake fluid, with moderate resistance to aldehydes and ketones.